318 Commonwealth is located on the south side of Commonwealth, between Hereford and Massachusetts Avenue, with 314 Commonwealth to the east and 320 Commonwealth to the west. 318 Commonwealth was designed by architect Samuel D. Kelley and built in 1881-1882 by Antoine Xavier and William Welch, builders, for building contractor John W. Shapleigh, one of two contiguous houses (318-320 Commonwealth) in the same design built for speculative sale. He is shown as the owner on the original building permit application for the two houses (one application for both houses), dated September 6, 1881. 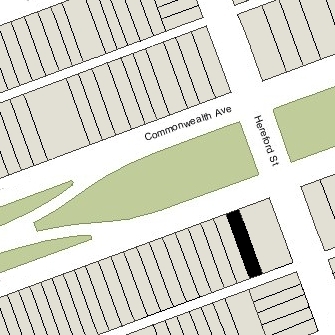 Click here for an index to the deeds for 318 Commonwealth, and click here for further information on the land on the south side of Commonwealth between Hereford and Massachusetts Avenue. On September 5, 1882, 318 Commonwealth was purchased from John Shapleigh by Mary Coffin (Lunt) Shepard, the wife of attorney Edward Olcott Shepard. They previously had lived at the Hotel Vendôme, and before that at 225 Marlborough. The Shepards continued to live at 318 Commonwealth during the 1889-1890 winter season, after which they appear to have made Newburyport their primary residence. Edward Shepard continued to practice law in Boston and to list 318 Commonwealth as his residence in the City Directories, and it appears likely that he maintained a town residence there while leasing most of the house to others. He died in April of 1903. During the 1890-1891 winter season, 318 Commonwealth was the home of Mr. and Mrs. J. N. Smith. The house was not listed in the 1892 and 1893 Blue Books. In 1893, 318 Commonwealth was the home of boot and shoe manufacturer Charles Henry Colburn and his wife, Frances Eudora (Draper) Colburn. Their primary residence was in Hopedale. On June 3, 1893, the Boston Globe reported that, Frances Colburn had notified the police that a bag containing an estimated $70,000 in diamonds and jewelry was missing and possibly stolen. Mrs. Colburn and their daughters, Helen Louise Colburn and Alice Draper Colburn, had moved from 318 Commonwealth to Hopedale on the previous day and discovered the loss upon their arrival at their country home. Charles Colburn had remained in town. The coachman was sent back to Boston and the Commonwealth Avenue home was thoroughly searched to no avail. However, when Charles Colburn was contacted, he reported that he had found the bag on an upstairs table, taken into his possession, and the jewelry was safe. 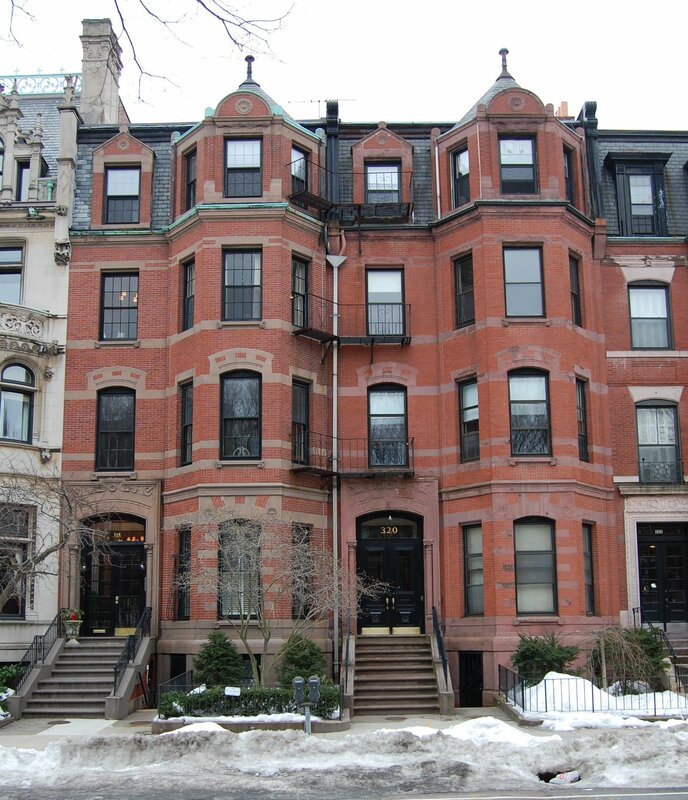 In July of 1893, the Colburns purchased 228 Beacon as their Boston home. By the 1893-1894 winter season, 318 Commonwealth was the home of Lucius H. Tuttle and his wife, Estelle Hazen (Martin) Tuttle. They previously had lived in New Haven, where he had been first vice president of the New York, New Haven, and Hartford Railroad. He was named president of the Boston and Maine Railroad in August of 1893 and moved to Boston to assume that position in October. The Tuttles continued to live at 318 Commonwealth during the 1906-1907 season, but moved thereafter to Brookline. 318 Commonwealth was not listed in the 1908 Blue Book. On April 29, 1908, 318 Commonwealth was acquired from Mary Shepard by wool merchant Conrad Hobbs. He and his wife, Jessie (Langmaid) Hobbs, made it their home. They previously had lived at 31 Hereford. They also maintained a home at North Grafton, Massachusetts. On November 7, 1908, he transferred the property into his wife’s name, and on April 2, 1915, she transferred it to his father, Warren D. Hobbs. Warren Hobbs died in February of 1922, and Jessie Hobbs acquired the property back from his estate and heirs. Conrad and Jessie Hobbs continued to live at 318 Commonwealth during the 1927-1928 winter season, but moved thereafter to 162 Riverway. 318 Commonwealth was not listed in the 1929-1930 Blue Books, nor in the 1929-1930 Lists of Residents, and was shown as vacant in the 1930 City Directory. On February 26, 1931, 318 Commonwealth was purchased from Jessie Hobbs by George J. Wilson. 318 Commonwealth was not listed in the 1931-1933 Blue Books, nor in the 1931-1933 Lists of Residents, and was shown as vacant in the 1930-1933 City Directories. On September 25, 1933, 318 Commonwealth was acquired from George Wilson by Phyllis Frank. She lived there with her father, Ludwig Frank, and her sister, Virginia Frank. They all previously had lived at 104 Hemenway. Ludwig Frank was an art teacher. He was founder and director of the Designers Art School at 729 Boylston. A designer and decorator of glass, china, and silverware, he had been head designer with Bigelow-Kennard & Co., silver and goldsmiths. Phyllis Frank was a secretary with the school, and Virginia Frank was a librarian. On November 13, 1933, Phyllis Frank transferred 318 Commonwealth to the Designers Art School. Ludwig Frank and his daughters continued to live at 318 Commonwealth in 1934, but had moved to 23 St. Stephen by 1935. On May 28, 1934, Frederick E. Johnston foreclosed on a mortgage from Phyllis Frank and took possession of 318 Commonwealth. The house was not listed in the 1934-1936 Blue Books, nor in the 1935-1936 Lists of Residents, and was shown as vacant in the 1935-1936 City Directories. On May 18, 1936, 318 Commonwealth was acquired from Frederick Johnston by Charles G. Densmore. In December of 1935, he applied for (and subsequently received) permission to convert the property from a single-family dwelling into four apartments. On April 29, 1938, the First Federal Savings and Loan Association of Boston foreclosed on its mortgage to Charles Densmore and took possession of the property. On December 31, 1938, 318 Commonwealth was acquired from First Federal Savings and Loan by Charles Stanley Kimball and his wife, Laura E. (Thompson) Kimball. They lived in Natick. On the same day, they transferred it to the Boston Management Corporation, a real estate management firm. Charles Kimball died in June of 1945, and on August 23, 1945, the Boston Management Corporation transferred the property back to Laura Kimball. On August 27, 1945, 318 Commonwealth was acquired from Laura Kimball by Signe Ingeborg (Brunstrom) Gavin, the wife of Basil Gavin, treasurer of the Boston Management Corporation. They lived in Millis. 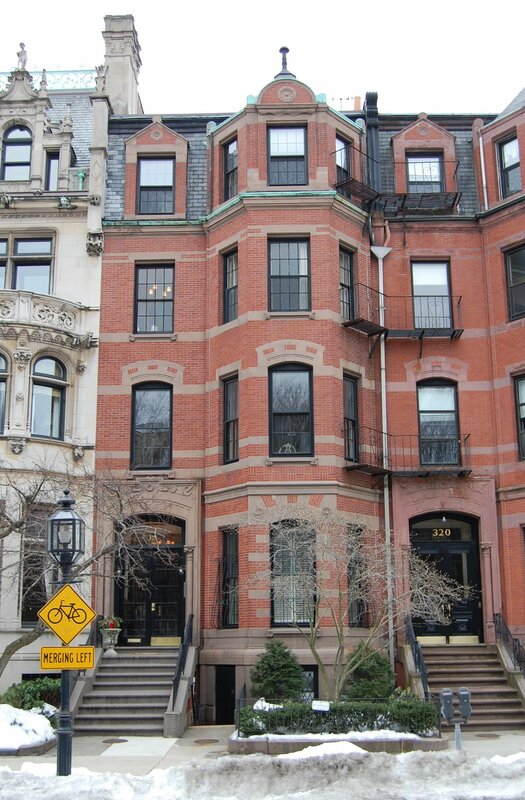 Basil and Signe Gavin divorced soon thereafter, and on November 28, 1947, the property was acquired from her by the Boston Management Corporation. She was a resident of Reno, Nevada, at the time of the transaction. On December 31, 1947, 318 Commonwealth was acquired from the Boston Management Corporation by Marguerite (Davis) Lynch, the widow of Richard E. Lynch, of Winchester, and on February 13, 1948, she transferred the property to 318 Commonwealth Avenue, Inc., of which Basil Gavin was the president. Basil Gavin and Marguerite (Davis) Lynch subsequently married, and on May 31, 1955, 318 Commonwealth Avenue, Inc., transferred the property to Basil Gavin, Marguerite Gavin, and Roscoe W. Brooks as trustees of the 318 Commonwealth Avenue Trust. Basil Gavin died in January of 1962, and Marguerite (Davis) Lynch Gavin died in September of 1975. On April 27, 1977, 318 Commonwealth was acquired from the 318 Commonwealth Avenue Trust by Betty Bishop. On December 1, 1977, she converted the property into five condominium units, the 318 Commonwealth Avenue Condominium. In January of 1979, she filed for (and subsequently received) permission to legalize the occupancy as five units.